Beautiful, well equipped villa in Northern Cyprus near the town of Bellapais, this villa has spectacular views of the mountains and the sea. 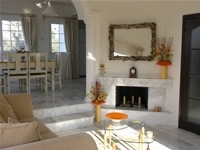 Having its own swimming pool, the villa has 3 bedrooms and sleeps up to 8 people. Downstairs accommodation includes a lounge, with beautiful views from the balcony, through to the fully fitted kitchen diner, with marble floors. The upstairs is reached via a sweeping marble staircase, and features 3 large bedrooms, 1 double and 2 twin rooms - with the Master bedroom having an en-suite. There is a separate family bathroom. A spacious airy living room with brand new tasteful and extremely comfortable decor, complete with fireplace. This room is air conditioned and is perfect to relax in after a lazy day by the pool! The ground floor consists of a fully fitted kitchen with granite worktops, including dishwasher and microwave, and a large dining area complete with dining table and chairs. The dining area leads directly onto the pool terrace. The master bedroom has a double bed, large fitted wardrobes, air conditioning and a balcony overlooking the sea, together with an en-suite shower room and toilet. Bedrooms 2 and 3 have twin beds with plentiful fitted wardrobes, and air conditioning. Bedroom 2 has a balcony. Both rooms have good views of sea and mountains.